Friday was a pretty big day for Sprint and HTC, joining up to launch the HTC EVO 4G (codename Supersonic). 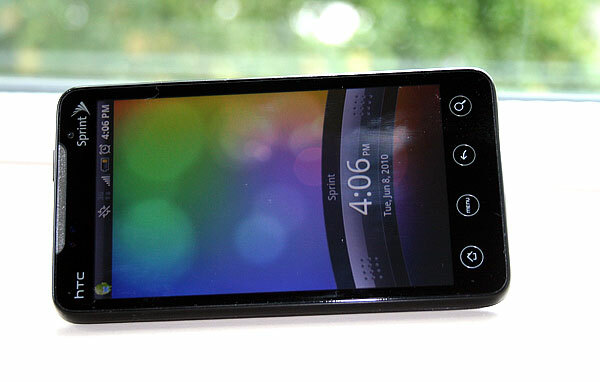 The EVO is the first mainstream 4G smartphone to launch in the US and runs on Sprint's fledgling 4G WiMAX network. I've got one, and I must say, it's a pretty beastly device, for reasons both good and bad. But we'll get to that in a minute. This isn't a full review, Anand is still waiting on his review sample before tackling that beast, but I thought I'd share some of my first impressions. First off, for those of you who have been hiding under a rock for the last few months, the EVO 4G is basically the biggest, baddest phone on the market. It's similar to the HD2 and carries over the same 4.3" 800x480 capacitive multitouch display and 1GHz Qualcomm Snapdragon SoC. On top of that, it has 512MB RAM, an 8 megapixel camera with 720p video recording, dual LED flash, a 1.3MP front facing camera for video chatting, Sense UI running on top of Eclair (Android 2.1), a 1500 mAh battery, and an 8GB microSD card included right out of the box. Think of it as a souped-up, Android-running HD2, or even a super-sized HTC Droid Incredible. Either way, this is one serious piece of kit. In person, it's a pretty huge phone. There's not much wasted space on the device, but the screen itself is nearly the same size as the entire iPhone 3G front face. A few millimeters larger than the iPhone in every direction, it ends up feeling a lot larger. More than the size, though, is the sheer mass of the EVO, weighing in at 6 ounces. That's a full 1.4 oz heavier than the iPhone 3G, and definitely noticeable in hand. But once you turn it on, all concerns about size wash away - that screen makes it all worth it. I'm a longtime iPhone user, and the WVGA resolution is pretty awesome compared to the 480x320 iPhone screen. Not that the iPhone screen is bad, just that the EVO has 2.5 times the number of pixels. It's so crisp, so amazing. Granted, the new iPhone 4 will ship with a 960x640 IPS screen by the end of the month, so the EVO won't stay amazing for long, but for now, it's a brilliant screen. Dimensions 4.8" x 2.6" x 0.5" 4.5" x 2.3" x 0.37" 4.5" x 2.4" x 0.48"
The Sense UI skin is pretty much the same as previous HTC devices, so it's familiar and works well. The UI is pretty slick, with more eye-candy than the iPhone, but an overall busier user experience. The Snapdragon processor slices through the interface like a hot knife through butter; it makes my old iPhone 3G feel like it operates in slow motion. I haven't run it side by side with an Incredible to verify Engadget's claim that the HTC Incredible runs significantly faster (despite having the same internals and OS), but either way, the EVO is nowhere near slow. My experience with 4G is still fairly limited at this point - Sprint's WiMax network has pretty good coverage in Seattle (significantly better than T-Mobile in my area, not quite as good as AT&T 3G) and speed tests show around 2.5 Mbps down and 1 Mbps upload. This isn't quite as good as expected, but I have some doubts with the Speedtest.net Android application itself, so we'll see. There are some other well-reviewed speed test apps in the Android Market that I plan to check out. But regardless of 4G speed, one thing the 4G radio definitely does is massacre battery life. You can basically kiss it goodbye if you have the 4G radio enabled. On launch day, I had to run almost as soon as I got my hands on the phone, so I just basically turned it on and threw it in my backpack. It was at around 40% battery when I did that. Two hours (of completely idle time) later, it gave me a 10% battery warning and a half hour after that it was dead. Apparently, 4G and GPS were enabled out of the box and I hadn't looked at that beforehand. With the 4G radio running, expect around 6 hours of IDLE battery life. If you're really hitting the 4G, expect far, far less than that. When we do our full review of the device we'll have detailed battery life tests. More reasonable real world battery tests give me more optimism that the EVO can last a full day of use, if you're careful. 15 hours of use with quite a few phone calls, some texting/email, GPS navigation to dinner, and a bit of 3G browsing took me from full charge to about 60% remaining (4G, GPS, Wifi, and Bluetooth radios all off). I got similar battery life on WiFi with zero phone calls, some email and browsing, and a 1 hour long Skype video chat through Fring. So, most people who aren't going crazy with the 4G can get a full day of use out of it (but not more than that). Still, it's pretty disappointing that the EVO's most touted feature is also the feature to avoid if you actually want to use the phone - I accidentally left 4G running (again), the battery died within a couple of hours, and I was basically without a phone for the rest of the day since I didn't notice the dead battery before running out the door. Essentially, use 4G at your peril. Other than that, though, it's great. The EVO goes up head to head against the similar HTC Droid Incredible on Verizon, the hotly anticipated iPhone 4 on AT&T, and the Samsung Galaxy S, which is rumoured to launch on T-Mobile this summer. With a lengthy list of standard features, the bleeding edge WiMax network, and Sprint's very reasonable data charges, it's a lot easier to overlook the suspect battery life and any other annoyances. If you're looking for a good reason to go for a more open platform than Apple's iOS, the EVO gives you a very enticing option. Apparently, the general public thinks so as well, with the EVO 4G selling out nationwide today, just five days after launch. Most stores had lines starting from the night before, and Sprint says this is their most successful device launch ever. After using the EVO 4G for a few days, I think it’s easy to see why. Small correction, no one knows the clock speed of the A4 in the iPhone 4. While Jobs was eager to flaunt the 1GHz speed of the iPad's A4, he said nothing about the speed of the iPhone 4's. I'm thinking he would have, if it was 1GHz. More likely its downclocked to maybe 600 ish. I used a Nexus One on AT&T and Motorola Milestone (GSM Droid) on AT&T. In fact AT&T has every single Android handset available... it's just not carrier branded. You just need to know how to get it unlocked.